Aside from knowing where to watch the next match live, one of the biggest headaches when it comes to following the World Cup is the time zone difference. It is horrible to drag yourself up in the middle of the night only to find out that you have missed the first half (or the whole match!) because you miscalculated the starting time. Things become plenty complicated when there are a lot of matches going on in different cities in different time zones, which is exactly the case with the upcoming World Cup in Brazil. Well FIFA has a solution. 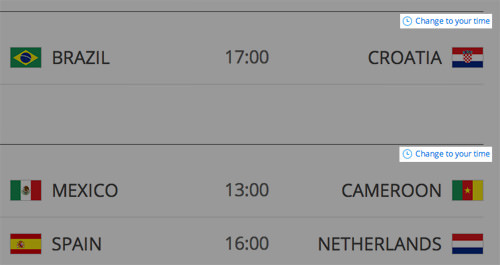 Their official match schedule has a handy little feature that will make time zone conversion worries a thing of the past. 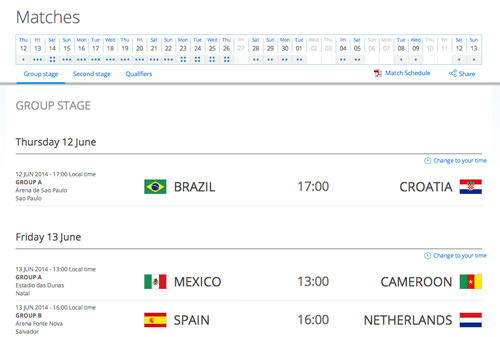 FIFA has a complete match schedule on their World Cup page, which you can visit here. This schedule shows you the times and dates of all the matches, from the first group stage match all the way to the finals. If you look at the schedule, you’ll see a Change to your time link. It does what it says on the tin, convert all the match times into your time zone, provided that your time zone is set correctly on your computer. 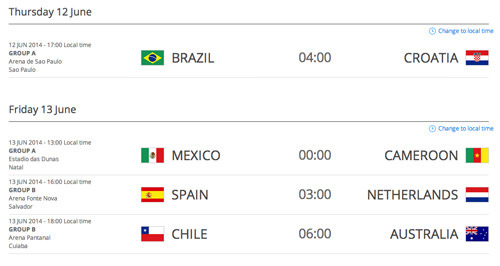 Click that and you’ll see all the match times change into the correct time for your time zone. Note that the dates don’t change though, which means you’re still going to have to manually figure out the date the match is on. Beyond this small niggle though, this might be one of the easiest ways to get the entire match schedule converted to your time zone.